As we have observed in our articles “The Deep State Tries To Destroy Donald Trump” and “The Judicial Coup Against President Trump” there is an anti-constitutional coup taking place in this country. And on Monday the coup plotters registered their first kill: LTG Mike Flynn, President Trump’s national security advisor. General Flynn was arguably the chief architect of the Trump administration’s national security strategy and, having been with Donald Trump since early in the primaries, was one of the chief influencers of President Trump’s view of how to deal with the many threats facing our country. “We are tired of Obama’s empty speeches and his misguided rhetoric. This has caused the world to have no respect for America’s word, nor does it fear our might,” Flynn said in his fiery speech to the Republican National Convention in July. In a very real sense stripping the Trump National Security Council of Mike Flynn’s influence strips the Trump NSC of Trumpism. Conservatives might fairly ask how someone so close to the President was brought down and were Flynn’s conversations with the Russians illegal or a national security threat? To answer the last questions first, as explained in our article “Democrats And Establishment Republicans Try To Torpedo Gen. Mike Flynn” the answers are no and no. Most laymen will not know that one of the constants in U.S. military affairs since the fall of the Soviet Union has been a military-to-military relationship with Russia. After 1991 the US spent billions of dollars through programs, such as the Department of Defense Cooperative Threat Reduction (CTR) Program, also known as the Nunn-Lugar Program, to help Russia secure its nuclear weapons complex, including a highly secret joint operation to remove weapons-grade uranium from unsecured storage depots in Kazakhstan. During the post-9/11 war in Afghanistan, Russia provided overflight rights for US cargo carriers and tankers, as well as access for the flow of weapons, ammunition, food and water the US military. Russia’s military also provided intelligence on the Islamist sympathies of the Boston Marathon bombers, helped the US negotiate rights to use an airbase in Kyrgyzstan and allegedly provided intelligence on Osama bin Laden’s whereabouts. Cooperation and communications with the Russians only became a problem when it came into conflict with Obama’s feckless decision to oust President Bashar al Assad of Syria. So how was General Flynn undermined so thoroughly that he lost the President’s confidence and resigned? First, it is important to understand that the deep state is especially concentrated in the intelligence and security apparatus of the federal government. General Flynn was at the center of the Obama deep state; he was Deputy to James Clapper, Obama’s Director of National Intelligence and he headed the Defense Intelligence Agency, the military's competitor to the CIA and NSA. Hersh claims the alarm about the danger of Obama’s policies in Syria became so great that in the autumn of 2013 that high levels of the American military decided to take steps against the extremists without going through political channels, by providing US intelligence to the militaries of other nations, on the understanding that it would be passed on to the Syrian army and used against the common enemy, Jabhat al-Nusra and Islamic State. Germany, Israel and Russia were in contact with the Syrian army, and able to exercise some influence over Assad’s decisions – it was through them that US intelligence would be shared, thus bypassing the White House and the CIA. Who was the “pushback” coming from? Flynn’s competitor, Director of the Central Intelligence Agency John Brennan. The same John Brennan who admitted lying to Congress, who helped cover-up Benghazi and who attacked relentlessly then-President-elect Trump during the transition. And we note, Washington Post columnist David Ignatius attributed his tip outing General Flynn’s discussion with the Russians to CIA sources. This begs the question how did they know the substance of General Flynn’s calls with the Russians? They got the material which was used to bring down Mike Flynn from operatives within the National Security Agency (NSA), one of the darkest agencies of the deep state – and releasing it was patently illegal. The Foreign Intelligence Surveillance Act of 1978 (FISA) governs the collection and dissemination of communications intercepted by the NSA. Under FISA collection of communications within the United States is strictly limited to communications with a foreign inception or terminus. The Department of Justice must apply to the FISA Court (FISC) to obtain a warrant authorizing electronic surveillance of foreign agents. For targets that are U.S. persons (U.S. citizens, permanent resident aliens, and U.S. corporations), FISA requires heightened requirements. One exception to the FISA Court rule is that the President may authorize electronic surveillance to acquire foreign intelligence information for periods of up to one year without a FISC court order where the Attorney General certifies that there is "no substantial likelihood that the surveillance will acquire the contents of any communication to which a U.S. person is a party," provided the surveillance is directed solely at communications among or between foreign powers, or "the acquisition of technical intelligence … from property or premises under the open and exclusive control of a foreign power." Why the NSA intercepted General Flynn’s perfectly legal conversation with the Russian Ambassador remains a mystery, as does who authorized it, but absent a FISA Court order the intercept would be on its face illegal. Secondly, dissemination of NSA intercepts is strictly governed to protect the privacy of “U.S. persons,” U.S. citizens, permanent resident aliens, and U.S. corporations; any identifying information is clipped and the conversation merely summarized in an analyst report. Analysts are supposed to use “minimization” procedures that don’t let them listen to the communications of Americans who may be caught in such eavesdropping. That is, they are supposed to protect the identity and speech of innocent Americans. Circulating an unclipped, un-summarized transcript beyond the very topmost levels of the government is extraordinary and an existential threat to constitutional liberty unless justified by an extraordinary threat. Moreover, the release of the transcript to a media organization or to any unauthorized party is a serious felony and a violation of the compact by which citizens have granted the federal government the authority to monitor communications in the name of national security. Whoever knowingly and willfully communicates … or otherwise makes available to an unauthorized person, or publishes … any classified information … obtained by the processes of communication intelligence from the communications of any foreign government … shall be fined under this title or imprisoned not more than ten years, or both. That means that the contents of those calls were “obtained by the processes of communication intelligence from the communications of [a] foreign government,” which in turn means that anyone who discloses them — or reports them to the public — is guilty of a felony under the statute. So, who would risk such a penalty? Someone who was sure they would never be prosecuted – because one of the conspirators was the Acting Attorney General – Sally Yates. Yates “informed the Trump White House late last month that she believed Michael Flynn had misled senior administration officials about the nature of his communications with the Russian ambassador to the United States,” claimed The Washington Post. And General Flynn’s old adversaries James R. Clapper Jr., Obama’s director of national intelligence, and John Brennan, Obama’s CIA director concurred. But why would Obama partisans at the CIA and elsewhere in the government during the transition risk such an operation against General Flynn? And the policy that was diminished in its tracks was that of John Brennan and President Barack Obama. For full background on this our friend David P. Goldman of PJ Media suggests you see Brad Hoff's July 2016 essay in Foreign Policy Journal: Flynn humiliated the bungling CIA and exposed the incompetence and deception of the Obama administration. Mike Flynn knew the Obama-Brennan policy in Syria was a failure, he prepared a widely-circulated assessment proving it, and he participated in the inside effort to clandestinely replace it with one that would ultimately see the defeat of the jihadi forces that he recognized as the primary threat in the Near East – three acts that probably got him fired as Director of the DIA and certainly earned him the undying enmity of Brennan and other Obama loyalists. But it isn’t just General Flynn’s involvement in the effort to circumvent the failed Obama-Brennan policy in Syria that put a target on his back. Flynn was also an outspoken opponent of Obama’s diplomatic legacy – the disastrous Iran nuclear weapons deal. Obama left behind a task force of loyalists, said to include former Obama administration adviser Ben Rhodes the architect of the disinformation campaign to sell the Iran deal, who deluged media outlets with stories aimed at eroding Flynn's credibility, multiple sources revealed to The Washington Free Beacon. The operation primarily focused on discrediting Flynn in order to handicap the Trump administration's efforts to disclose secret details of the nuclear deal with Iran that had been long hidden by the Obama administration. Flynn had been preparing to publicize many of the details about the nuclear deal that had been intentionally hidden by the Obama administration as part of its effort to garner support for the deal, these sources told The Washington Free Beacon’s Adam Kredo. Flynn is now "gone before anybody can see what happened" with these secret agreements, said a second insider close to Flynn and the White House. "[Flynn] was a withering critic of Obama's biggest foreign policy initiative, the Iran deal," Lake said. "He also publicly accused the administration of keeping classified documents found in the Osama bin Laden raid that showed Iran's close relationship with al Qaeda. He was a thorn in their side." However, Mike Flynn’s battles against the Obama administration and the personal vendetta waged against him by those whom he showed to be his intellectual inferiors isn’t the real battle here. "The larger issue that should trouble the American people is the far-reaching power of unknown, unelected apparatchiks in the Intelligence Community deciding for themselves both who serves in government and what is an acceptable policy they will allow the elected representatives of the people to pursue," said one of the national security advisors interviewed by Adam Kredo. General Mike Flynn is a brilliant intelligence operator and a patriot. The saga of the political assassination of General Flynn is full of lessons about the power of the Obama deep state of which Flynn was once a part, but of which he became a vociferous -- and courageously honest -- critic. In Afghanistan and at the DIA Mike Flynn proved that his adversaries were shallow, small-minded and incompetent against America’s greatest enemies, but in their shallowness, small-mindedness and incompetence they were still vicious enough and tenacious enough to get him. The question now before President Trump is, unless he cleans house down to the subflooring and roots out the leakers and the Obama loyalists in the American intelligence and security apparatus, who is next on the deep state’s kill list? Submitted by email_registrat... on Fri, 02/17/2017 - 13:20.
wrong and I am not sure he did lie to VP PENSE. Who would have thought it was something he would have to tell. Who made the call? was it pleasant? was it about the countries business when they talked and was that conversation so important to say it would hurt 1. Trump or 2 VP Pense or 3. this country which he loves. I know there is something else behind this whole thing and I am not happy that Flynn resigned from OUR SERVICE!!! I saw it bucking Obama and what he was doing and he was right. He is a fighter for this country and I think he was not wrong but the news media was very wrong and who gave them that (NSA) information and have the news media gotten so "I got you" that they reported on something that was illegal and did not know the difference in their actions. I blame the news media and the NSA but this is not over for now I am mad about the whole thing. They better find the person and put him in jail.. It was a private conversation and since we all know Flynn worked hard to stop the illegal stuff Obama was so use to doing for Congress did not do their job either. They just hung out Flynn and let him take care of Obama. OBAMA needs to be prosecuted for treason and there is NO TIME LIMITS ON THAT CHARGE. 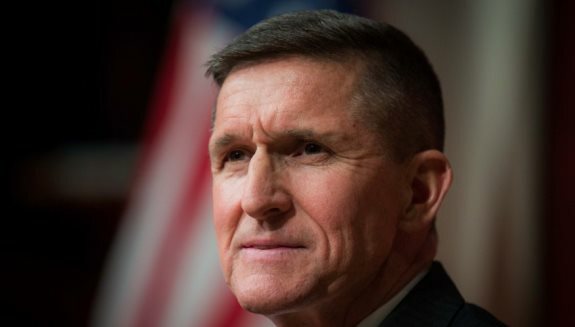 I think that Flynn needs to be given another position in our government for that man is not just good at what he does, he is very good at what he does and he stands tall when things are not right and protects his homeland and ours. I want him back in our government after all "the Secretary of Treasury did not tell people he had not filled out his taxes for several years. That person is equal to Flynn talking to the ambassador on the phone. Sorry, I see his character not one action. We need him back in Government!!!!! Submitted by email_registrat... on Thu, 02/16/2017 - 14:48. In searching what and who to blame for their historical beating administered by the American people, our communists, socialists, progressives, Democrats and other bottom-feeders and slime of this once free and proud country decided to blame the Russian hacking. As the result, our half-breed Marxist Muslim President from Kenya B. Hussein Obama ejected 30 Russian diplomats from the country and confiscated their two vacation villas by one of his executive orders. After Trump’s victory, it was to be expected the Russians would inquire about that totally illegal order – but Trump’s choices for his new government have shown themselves as cowards and innocent ignoramuses. Instead of explaining his communication with the Russians the creep resigned – and that Obama’s order still stands! Trump will drain that Washington swamp – like hell he will! Our federal government has grown under Obama by 220,000 unionized employees, all working on the destruction of Trump’s government by leaking, by lying, by sabotage, by treason – from the inside. By “the innocent ignoramuses” above I meant for one the newly resigned General Flynn who had no idea about the criminals he was dealing with – the general just one among other such political innocents. By the way – there is not a scintilla of any evidence of Russian hacking and they have every right to inquire about that totally illegal seizure of their property and about that “diktat” of our former president Obama. Submitted by email_registrat... on Thu, 02/16/2017 - 12:19.
the FISA courts as they used the IRS to bring down and quiet their enemies. being heaped on him as a result.